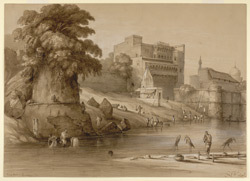 Sepia wash drawing of part of Buxar fort, showing a shrine and ghat below, with people bathing and drawing water from the river by George Francis White (1808-1898) sometime between the 1820s and 1840s. The image is inscribed: 'Buxar Ghaut. Ganges R. G.F.W. delt'. Buxar, also spelled Baksar, is an ancient town located in north eastern India just south of the Ganges River. It is a place of Hindu pilgrimage having connections with the god Rama. The small fort here was of importance due to its position commanding the Ganges. An important battle took place here on 23rd October 1764 when the British defeated the combined forces of Shuja-ud-Dowlah and Kasim Ali Khan and became the paramount power in Bengal.